Real Madrid made more than £300m during David Beckham's four years at the club. 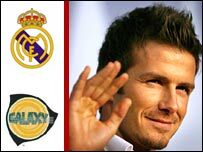 Beckham, who is set to make his debut for LA Galaxy in the USA later in July, moved to Spain for £25m from Manchester United in 2003. And Madrid claim they sold one million shirts within the first six months of Beckham's arrival at the Bernabeu. "In four years that Beckham played in Madrid we generated more than £300m in commercial activities," marketing director Jose Sanchez told The Sun. "In the time that Beckham was here, profits from merchandising increased by 137%," he added. The former England captain, 32, will be officially unveiled by LA Galaxy on 13 July after signing a five-year contract with LA Galaxy which could be worth up to £125m in salary and endorsements. Advertising firm Saatchi and Saatchi last month told BBC Sport that Beckham's departure would not affect Madrid's finances. Alex Fynn said: "If Real win La Liga and Beckham goes, there won't even be a blip that will be felt." Deloitte and Touche rate Real as the world's wealthiest club in terms of sales as its revenues rose to £202m from £186.2m in the last 12 months.